This year’s League Trebles event saw a total of 33 players take part, meaning a total of 11 teams were formed on the night and they were all fighting for the right to become trebles champions. 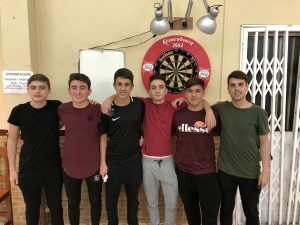 This year’s tournament enjoyed a successful night of darts with 5 youth players playing in the final proving yet again that the Youth Academy system is developing players for the future. In the first round we saw the team of Dylan Duo, Antony Lopez and Christian Tosso survive a major scare against the family team of the Asquez’s. Dylan managed to take out a big finish on the bull with their opponents on a double to win the match 3-2 ,t he team consisted of Roy, Jayce and Eric Asquez. We also saw the two Mons Calpe teams ease through their games with 3-1 wins respectively. David Francis, Steven Borge and former national champion Francis Taylor also managed to get the better of their rivals with a 3-0 whitewash. In the first semi final we saw the team of David, Steven and Francis suffer a 3-0 loss against Jarvis, Sean, and Justin Hewitt. The three youngsters who play their local darts for Mons Calpe managed to pull out a staggering performance to win this game with ease. The other semi final was a thriller of a match with both teams treating us to a last leg decider. The team of Craig Galliano, Ethan Smith and Jerome Duarte managed to make a comeback to level the game. In the last and final leg, Dylan, Antony and Tosso secured a comfortable lead which they threw away by missing doubles. Their opponents were quick to capitalise and keep their cool taking out their finish to book their place in the final with a 3-2 win. 1st leg- After both teams missed doubles Jarvis managed to hit double 15 for the 1-0 lead. 2nd leg- Craig managed to pull out a 93 check out under pressure to level the game 1-1, after a heavy display of scoring from both teams. 3rd leg- Craig managed to pull off a second consecutive high finish (102 Checkout) to give his team a 2-1 lead. 4th leg- Jarvis hits double 10 to level the game 2-2 taking the final to a last leg decider. 5th leg- The 5th leg saw Jarvis, Sean and Hewitt take a comfortable lead. They missed some doubles before finishing 50 for the title. They now become the youngest team in the GDA’s history to win the title.